Hey there! 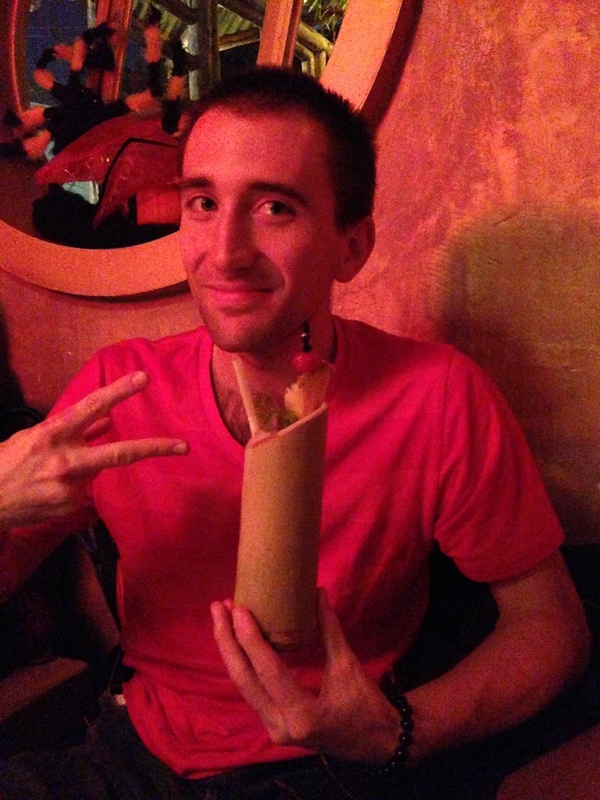 So this post is just going to be a quick review of a unique watering hole that I recently tried in Itaewon. 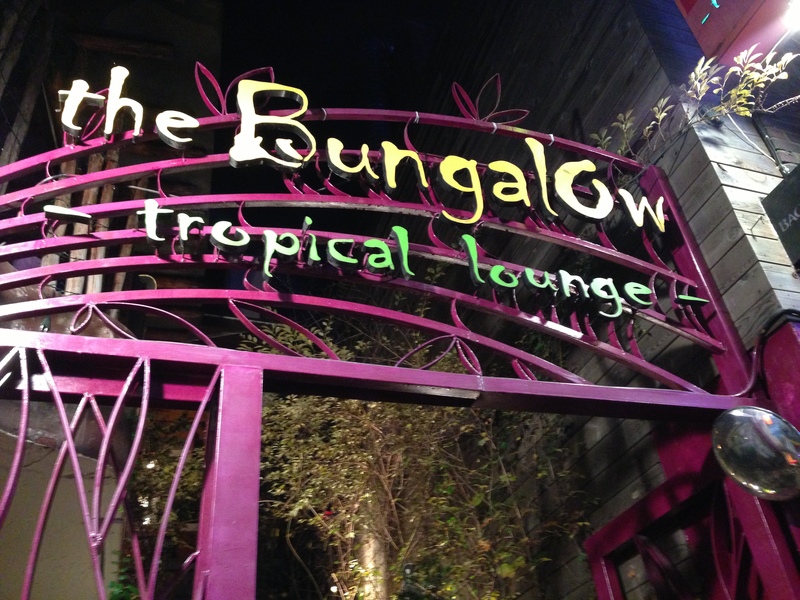 It’s called the Bungalow, and it’s located at 112-3 Itaewon-dong Yongsan-gu Seoul South Korea. You have to go to the Itaewon metro stop and go out exit 2. Walk past the Hamilton Hotel, and make a left on the first street on your left. You’ll walk past the Flying Pan on your right hand side, and you’ll make a right on the next road you encounter. Walk straight past Tomatillo, and it’ll be on your left hand side. I originally was supposed to go here with my friend a month ago, but I was in severe pain from a soccer injury. Sadly, I had to pass since I couldn’t even climb the steps it had gotten that bad. This time around, I was fully able, and walked up the stairs to see what I had been missing all this time. It was softly lit, but there were Halloween decorations everywhere including plenty of flickering candles, skeletons, and bats. We went upstairs, and it definitely had more of a tropical theme going on with the surf shack room that stood opposite our unique seating arrangement. My friend had originally told me that you could sit in swinging beach chairs and put your feet in sand and a pool. Our seats sadly were not big beach chairs, but we got lucky enough to sink our feet in some cool, clean white sand. Just hanging with random Koreans in the beach room. Note how all their legs are crossed underneath them. It was hilarious watching the Koreans react to the beach room. They would refuse to sit in the sand room if there were other seats available. If they did end up sitting in the beach room, they act out their own version of the kid’s game “The Floor is Lava” as they walked on the furniture to avoid contact with the sand. This show was worth the price of admission, but I also wanted a drink to go along with the spectacle. So, I browsed through their menu which had cocktails, beer, non-alcoholic drinks, and food. Initially, I wanted to get a drink in a coconut, but they were all sold out. So, I went for a Hawaiian Punch (10,000) which consisted of rum and vodka and various fruit juices. A point of interest was the fact that my friend’s non-alcoholic drink was more expensive than mine. I like the cut of your jib, Bungalow. The presentation was pretty good as it was served out of a cup that was designed to look like a bamboo shoot shorn in half, and there was a skewer of pineapple and cherries sticking out of it. Tastewise, it was everything I was expecting from a tropical drink: fruity, sweet, and with a slight kick at the end that reminded me I was drinking alcohol. Overall, the Bungalow wasn’t anything close to lounging out on a beach in Bora Bora with a drink in my hand, but it was a fun experience to have my own sandy piece of paradise within a bar. Posted in Alcoholic, Beverages, Mixed Drinks, Non-Alcoholic and tagged beach, drinks, Hawaii, Itaewon, punch, rum, sand, tropical, vodka. Bookmark the permalink. I enjoyed the blog but it is not Bora Bora. 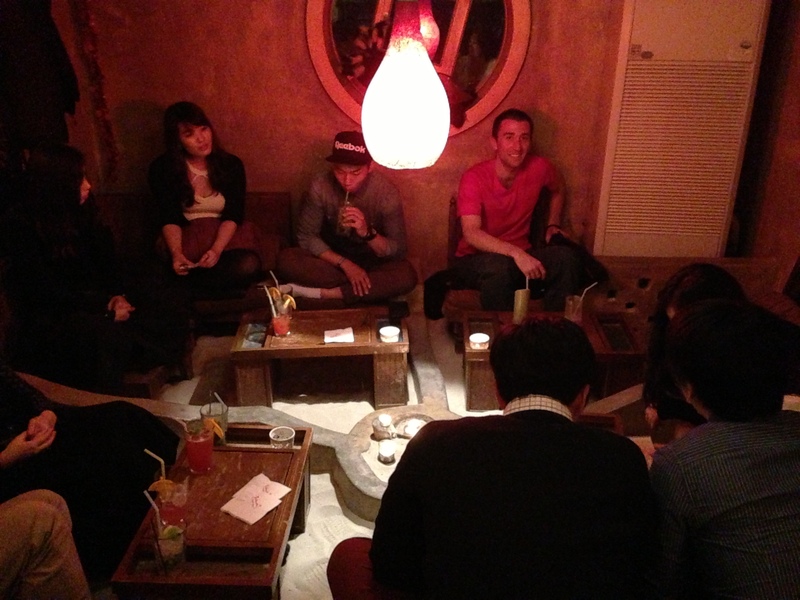 It is a nice place to relax with some friends and have a few cocktails. I liked the Hawaiian Punch. Like the old commercial with the little guy with the straw hat . How about a Hawaiian punch? Haha, yeah that’s all I was thinking of when I ordered it. It actually tasted like Hawaiian Punch!